Things Calderdale at ATO, Thurs 25th Feb. The next All Things Open is on Thurs 25th Feb and will play host to the inaugural meeting of The Things Network Calderdale. The Things Network is an initiative that started in Amsterdam and succeeded in crowdsourcing an entire city-wide Internet of Things (IoT) data network in only 6 weeks. Unlike 3G/4G and WiFi, no mobile subscriptions or WiFi codes are required and, thanks to a breakthrough wireless technology called LoRaWAN, a single gateway can cover a dense urban area of 1-2km, and up to an incredible 15km in line of sight. All using license exempt wireless spectrum and low power radio. Since IoT devices typically transmit and receive tiny amounts of data, gateways will use a negligible amount of bandwidth on the broadband line they are connected to. Given that LoRaWAN is particularly energy-efficient and built on low power radio, gateways also consume very little electricity and sensor nodes can run on AA batteries for a year or more, depending on the application. The application of particular interest to us in the first instance is flood monitoring. 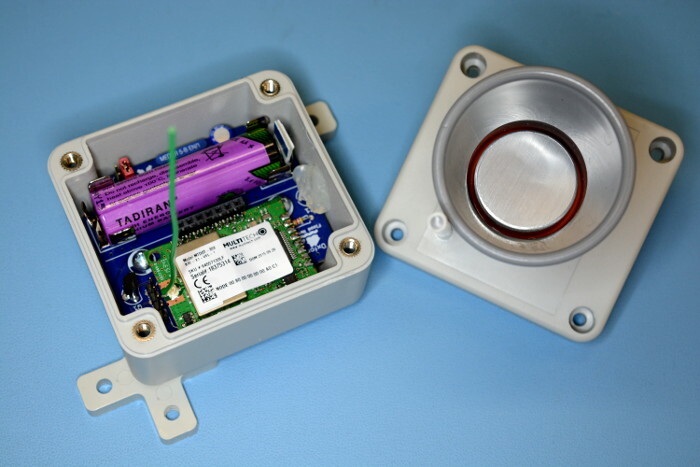 Above can be seen a prototype LoRaWAN river level sensor from Flood Network, who provide technology for building crowdsourced hyperlocal networks of sensors. These are low cost, simple to install and do not need to be in contact with water, since they bounce ultrasound off the surface to measure the depth. This is only the beginning and a free and open data network — owned and operated by the community — could be put to many more important uses. Such as pollution monitoring, for example. The meeting on Thurs 25th will kick off at 7PM with an informal discussion and a status update on the first two gateway installs. If you’re interested in helping to build The Things Network Calderdale, flood monitoring or perhaps other potential uses, come along. There will be tea/coffee making facilities and feel free to bring along snacks and drinks. We’ll likely then move on to a local pub at around 9PM.